A historically accurate, visually engaging 15 minute documentary film and historical report available in print, online, DVD and USB card. Underneath the hustle and bustle of Central train station lies a deep, unique history laced with one predominate theme: time. Before the advent of railways, time used to be governed loosely by the movement and position of the sun. Although this system sufficed for years, trains brought with them a need for a precise schedule to provide the regular service. It was the beginning of a new era of rich Railway history. The project was a high-quality output, featuring outstanding graphics and imagery. The historical research was also comprehensive, and provided context to the overall theme of ‘railway time’. In order to bring the story of time to life in a manner relevant to modern community, Sydney Trains needed a company with extensive experience in interpreting heritage for contemporary audiences and Art of Multimedia was delighted to be tasked with this responsibility. Based on the comprehensive internal audit conducted by Sydney Trains Heritage Office, the clock collection was documented and past and present rail employees with experience in managing the clock collection and modern timekeeping technologies were identified for interviews. AOM’s historian conducted extensive research of existing Sydney Trains archives, as well as other NSW sources for historical facts and images. The resulting 15-minute documentary weaves together fascinating stories filmed over 3 days in locations such as The Clock Room, Central Clock Tower and supplemented with images of beautiful and rare clocks and stations, brought together with minimalistic motion graphics to create an engaging film. The oral histories were combined with the research and photography into a polished historical report available in print. “ Running on time. Clocks and timekeeping in the NSW Railways” also includes a photographic timeline documenting NSW Railways clocks from different manufacturers, as used throughout the history, to demonstrate the dramatic changes in railway timekeeping technology. 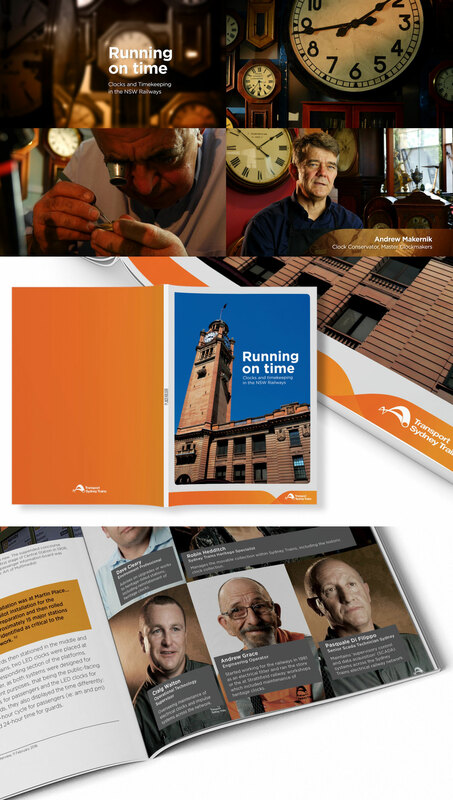 The film is available from Sydney Trains Heritage office website, on DVD and USB card and the film’s viewing and Clock Tower tours were booked out within hours of posting on Facebook. This combination of digital and print resources, allowed Sydney Trains to deliver a quality heritage interpretation and education experience that can be appreciated by the general public, as well as history buffs everywhere. “Feedback to the project has been extremely positive, with both internal staff as well as external customers who viewed the video during Heritage Week in April 2015 providing great responses and engaging with the content” said Craig.